Here is Drake net worth – What you must know (2019). Born Aubrey Drake Graham in 1986, Toronto, Canada. Drake is a singer, rapper and business mogul. He got his start in music from high school and metarmophosed into a colossal influence in the world of music. Drake is amongst Forbes richest musicians list standing at the fifth spot. Obviously he’s done impressively well for himself at such a youthful age, utilizing his prime and talent to amass treasures for his coffers. He’s strikingly rich, thanks to music which gave way for the business path that sky-rocketed his net worth. When he delved into music proper as a career path, his goal was to be wealthy through it, his net worth is the perfect testimonial for that goal. Drake net worth is sourced from the following platforms. The rapper has reportedly made over $14.4 million on album sales and with over 50 million singles sold, that amounted to an additional $11million on just music sales. Almost every big act in the industry rakes in excess of millions form YouTube views and Drake isn’t an exception. With over 178 million views on his YouTube page and an awestruck 2.78 billion views on his VEVO channel, you can be great assured Drake could purchase a neighborhood if he so desires. Drake is the co-founder of “October’s Very Own” record label. From this label most of his mega albums were merchandised summing up to huge returns for the label which has grown to be a huge entertainment outfit. This is probably the fastest lane of raking income for artist as just a sole tour or a single concert can oil their accounts better than months of hardwork in the studio trying to release a hit jam. But without the hit songs there would be no tours, so the tours are facilitated by the spell-bound songs. Drake reportedly made a whooping $71 million on his sweet sixteen summer tour. In 2010, his concert tour could be held responsible for 85% of the total $18 million amassed. Drake has been a participant of lots of endorsement deals for brands promotion. Notably Sprite, Nike and fast food resturant Burger King and Whataburger. These deals weren’t for peanuts. 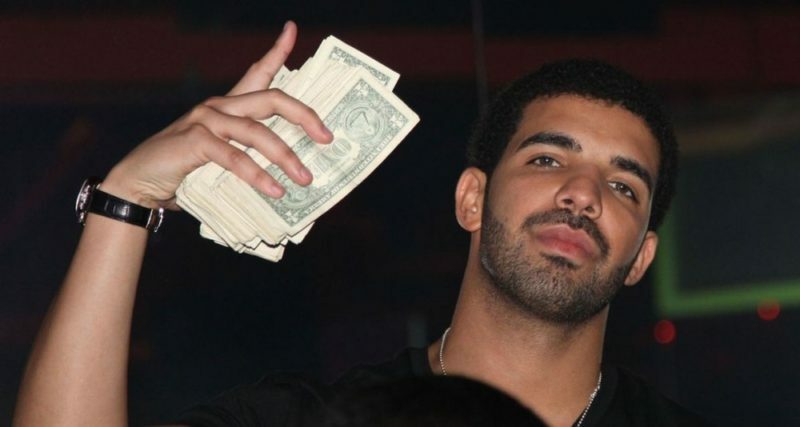 Between 2016 and 2017 Drake who was the highest paid celebrity at the time made over $94 million in endorsements. Drake had also partnered with Apple Music in a deal worth $19 million and the Brand recorded a huge success from Drake’s appearance in the picture. He’s also the global ambassador of Toronto Raptors, a basketball team. Having being hardwired with a knack for insatiable wealth, Drake announced the launch of his Bourbon based whiskey Virginia Black. The company did very well selling over 4,000 bottles in it’s maiden week locally which triggered an astronomical rise in his financial worth. The brand was promoted wherever the act toured and performed which translated to massive sales. For his multiple sources of wealth and investments, coupled with doing great music, Drake’s net worth is valued at an estimated $90 million.